The latest version of the Nikon Metrology Newsmagazine Volume 13 – is now available and can be downloaded here. In Newsmagazine Volume 13, read some of the most recent case stories from clients including University of Manchester, Stoneridge and Sintavia. The latest Nikon Metrology Newsmagazine Volume 13 is now available - download below. In Newsmagazine Volume 13, read some of the most recent case stories from clients including University of Manchester, Stoneridge and Sintavia. A prominent topic in this year’s Newsmagazine is quality assurance for AM (additive manufactured) components. Read about how the LC15Dx laser scanner is used in post-processing additive manufactured medical implants and why for one of the leading additive manufacturing companies, CT is the vital inspection solution for identifying defects and internal dimensional analysis. 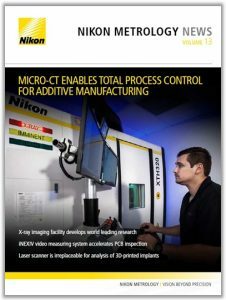 In other stories, an automotive supplier identifies mystery error using Nikon laser scanner, iNEXIV video measuring system accelerates PCB inspection and Nikon Metrology delivers its 1,000th 160 kV X-ray source for electronics inspection systems. For those attending the Control show (24th – 27th April), don’t forget to pick up a copy from Nikon Metrology at booth 7212, hall 7.